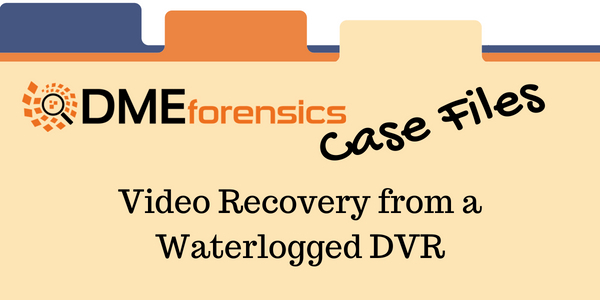 Case Files: Video Recovery from a Waterlogged DVR - DME Forensics Inc.
On the afternoon of May 27, 2018, the small, historic town of Ellicott City, Maryland received over 8 inches of rain in about 2 hours, causing tremendous flash flood damage along the historic main street area. Numerous small businesses and residents in this area were inundated by water and mud. As part of the county’s recovery efforts, our firm volunteered to assist the residents and business owners with the recovery of data from their waterlogged devices. As part of this process, we located several DVRs within local business’. For one business owner, the recovery of this data was crucial to prove to her insurance company that her small antique store had been fully stocked just before the flood, and to document that the flood waters had been responsible for the losses. Once were able to remove and clean the hard drive, we were able to recover and view data from the DVR. However, being an inexpensive DVR with an obscure file system, our traditional digital forensic tools were unable to read and parse the filesystem, effectively keeping us from viewing the video footage we knew existed. We had used DVR Examiner successfully in previous matters, and quickly turned to this software again. Once the drive image was loaded into DVR Examiner, we were able to almost instantly begin viewing and exporting the video. The folks at DME Forensics partnered with us for this unique case, enabling us to recover this video at no cost to the business owner. These videos included dramatic footage of the rapidly rising water and the owner’s frantic efforts to save her store. We will continue to keep DVR Examiner as our go-to tool when recovering video from DVRs.